GULFPORT, Miss. 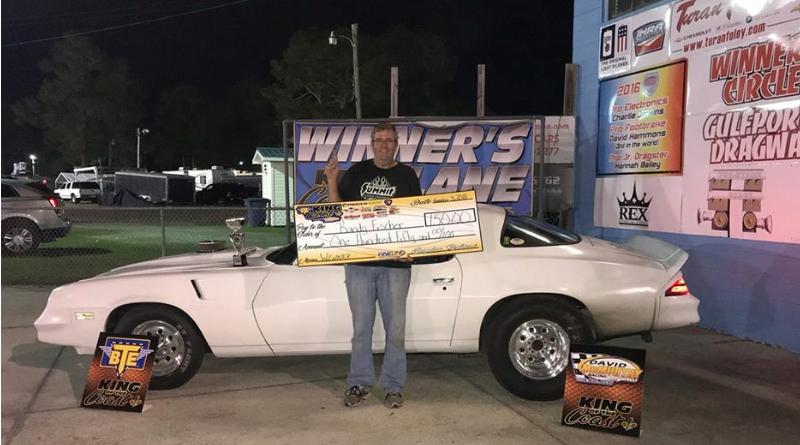 – Gulfport Dragway hosted the BTE King of the Coast Bracket Racing Series this past weekend which featured big dollar bracket racing in a variety of classes including Electronics, Footbrake, Sportsman, and Jr. Dragster. The event, which was presented by McMurty Racing Engines, kicked off on Friday with a Gamblers race. Shallon Broussard of Conerco, La. collected the event win after defeating Larry Seguin in the final round. Landon Neely and David Hammons were semifinalists. 188 contestants showed up on Saturday for Day 2 of the BTE KOC series for their shot at a big payday. The Jr. Dragsters were also competing for 5ft tall trophies. At the end of the day it would be Brandon Henry earning the Electronics victory, Eddie Rider taking home the Footbrake win, Randy Fischer collecting the Sportsman victory, Jordan Broussard earning the Jr. Dragster 13-17 win, Rylee Wells collecting the Jr. Dragster 10-12 crown, and Bryce Fairley taking home the Jr. Dragster 8-9 trophy. See photos below. As the racing action moved into Day 3 on Sunday, the weather failed to cooperate as rain interrupted the event during the 3rd round leading to the cancellation of Day 3.